Manufacturer of a wide range of products which include ms hose clamp. 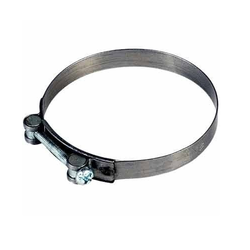 Empowered with a team of passionate personnel, we are engaged in offering a broad collection of MS Hose Clamp. The offered clamp is manufactured using optimum grade stainless steel metal and sophisticated machines at our vendor’s end. Our offered clamp is widely demanded to attach the hose to the fitting in industries like chemical, food, beverage, automobile, etc. We offer this clamp to our clients in different sizes and dimensions as per their necessities.